Thanks to the Late Night segment featuring Robinson Cano, today’s M’s game is one of the more anticipated match-ups on the daily schedule. Can’t think of the last time that would’ve been true; maybe Felix’s first post-perfection start? Ichiro’s first game in pinstripes would qualify as well. One of the stories of the pre-season was CC Sabathia’s dramatic weight loss. The formerly hefty lefty had lost at least one MPH in average fastball velocity in the last two years (from 2011-2012, and from 2012-2013), so re-focusing on stamina, core strength and the like seemed to make sense. But the early returns aren’t great, at least if velocity was the target of CC”s program. Instead of halting the decline, it’s picked up speed, and Sabathia’s average fastball today barely cracks 90mph. The formidable slider that used to destroy lefties doesn’t have quite the same bite, so he’s a bit less effective against lefties in recent years. That said, he’s faced righty-dominant lineups routinely, and to the degree he’s slipped, it’s really been a function of right-handers hitting him a lot harder than they did in 2010 and before. Still, this an experienced and extremely talented pitcher, so Sabathia’s not a pushover at all. His K% is up this year, and his GB% is suddenly at a career high – over 10 percentage points above his career average. He’s using a sinker much more than he did in the past – basically doubling the percentage he throws to righties, and as righties make up 3/4 of the batters he sees, that’s a lot of sinkers. Chris Young’s superficially the same pitcher he always was – he’s got a very low BABIP and a sky-high strand rate, and thus his FIP is atrocious but his ERA’s more than adequate. Sure, he’s faced Houston and Miami, but he’s also faced Oakland twice, and that’s a much better offensive club than New York is. That said, Oakland/Seattle are much, much better parks to pitch in than new Yankee stadium with its inviting right-field fence. Andrew Carraway and Scott DeCecco make the only two starts in the M’s system today, as Clinton’s double-header was postponed. Back when Maurer first came up, I thought he reminded me a bit of Harrison in terms of pitch movement and repertoire. To be sure, Maurer was much more of a fastball/slider guy (sometimes moving towards a slider/fastball guy), and obviously Maurer’s a righty and Harrison’s not. Then there’s the fact that Harrison’s had some MLB success while Maurer’s…shown flashes, or something. Today, they’ll face off against each other – Maurer getting a second start after an extremely encouraging game in Miami, while Harrison makes his first start of the year after back surgery. Harrison pitched in spring training, but his velocity was down significantly from prior years – around 90-91 from 93 or so (though the Rangers think he made some progress towards the end of the spring). He’s made a rehab start or two, but even there, it’s not clear his velocity’s all the way back. Harrison uses a sinker, a four-seamer, a good change, and a curve and occasional cutter. He’s faced mostly righties in his Texas career, as he’s got fairly standard platoon splits – this is part of the reason why he hasn’t thrown as many cutter/curves. The M’s can actually throw out quite a few right-handed bats right now, but they’re still not hitting lefties terribly well. Some of this may be due to the quality of the lefties they’ve faced, and some of it is just luck. In fact, the M’s biggest problem on offense has been their production against right-handed pitchers. Against lefties, the M’s haven’t been great, and they’ve not hit for power, but they clear the low bar of a .300 OBP. Against righties, the M’s *have* hit for power, but that’s about the only semi-positive thing you can say about them. Maurer’s emergence was sorely needed, as the M’s pitching depth has taken a big hit. But Hisashi Iwakuma’s getting closer to returning too – he’s starting today for Tacoma as they take on Las Vegas at Cashman Field. Steven Landazuri, who’s had a very good start for AA Jackson, takes the hill against Mobile, and top prospect Edwin Diaz starts for Clinton against Cedar Rapids. Sort of odd that it took Justin Smoak of all people to help pull us off the ledge, even as Fernando Rodney tried to shove us closer. The M’s desperately needed a few wins, and they got them, albeit barely. I saw several Felix jerseys today at the Sounders game; to those about to pull a personal double-header, I hereby salute you. Lewis has been better than I would’ve expected, especially early on. He’s been a bit unlucky, thanks to a sky-high BABIP – which, come to think of it, is pretty hard to do for a guy who gets so many fly outs. That said, his platoon splits – which were always something of an issue – have widened, hence the M’s lefty-heavy line-up. I’m still struck by Lewis’ ability to avoid the HR problems that plague Blake Beavan (and Erasmo Ramirez) while throwing 89mph fastballs in the zone. As he’s lost some zip on his slider, and as managers stack their line-ups with more lefties, he’s naturally getting fewer K’s. But he’s simply stopped walking anyone to compensate. That sounds good in practice, but I’m just not sure how he can do it without HR/9 rates approaching 2. Whatever he’s doing, Blake Beavan, would love to know how to do it too. I wondered if the M’s might have been trying to stack their line-up with fly-ball hitters against the groundballing Robbie Ross, but if they were, it obviously didn’t matter. 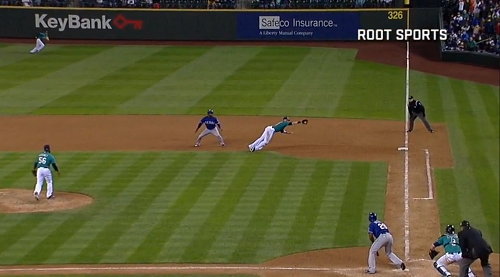 Here’s to Neal Cotts for bailing them out with one of the worst half-innings vs. the M’s in recent memory, though to be fair, it would essentially IDENTICAL to Rodney’s if Smoak hadn’t flown to his left to snare that line drive. The M’s are really, really struggling against ground-ball pitchers, and while a good chunk of that is two games against Ross, the problem looks like it runs deeper than that. It’s not an issue tonight, but it’s something to keep an eye on over the course of the year. Fernando Rodney got a save last night. The usual convention is to say that a guy earned a save, but the usual convention doesn’t apply in this case, as the only thing Rodney earned was mass contempt. We can laugh about the game because of the way it ended, and because of the way it ended, people are less down on Rodney than they would be otherwise. Things would be worse if the Mariners had lost. But, Rodney got the last two outs while trying to give up the tying and go-ahead runs. The guy who really earned the save was Justin Smoak, who was worth more WAR in one game than he had been worth in his entire big-league career before. With that said, in fairness to Rodney, if last night was a lucky successful save, then last week had an unlucky blown save. So for Rodney, it’s evened out, in no time. There are a few points to make here. Already, people can’t stand having Fernando Rodney closing games. He hasn’t been throwing nearly enough strikes, and given that he occupies the most high-leverage role on the team, fans are going to be less patient with him than they are with other players, since his mistakes are magnified. Fans of most teams find their closer uncomfortable. Fans of most teams think their closer has a nasty habit of making things interesting. Rodney’s no different, and while an ability to make games interesting is something the Mariners have sorely lacked for basically a decade, his ride has been especially frightening. When a pitcher in the ninth can’t find the zone, as a fan you feel completely helpless. As a fan you’re always helpless, but wild closers are slow torture. At least dinger closers are abrupt, surprising torture. There’s something important to understand about Rodney, though. The walks have always been there, and the walks are always going to be there. But he doesn’t get hit. He lets too many batters get one base, but few have managed to get more. Going back to 2000, 372 pitchers have thrown at least 500 innings. Rodney’s .342 slugging percentage against ranks 14th-lowest. Somewhat appropriately, he’s tied with Jose Valverde, and Chris Sale’s at .347. Felix is at .356. And since 2010, 309 pitchers have thrown at least 200 innings. Rodney’s .300 slugging percentage against ranks ninth-lowest. He’s between Koji Uehara and Greg Holland, a few points in front of Clayton Kershaw. 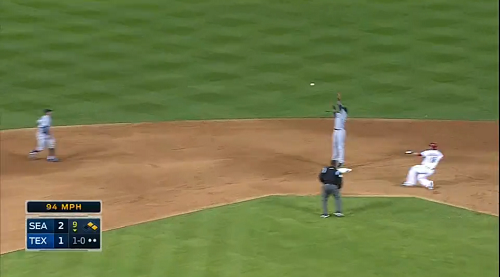 Rodney can’t keep walking batters like this, but he manufactures his own trouble. Hitters are frequently on the defensive, and this is a credit to Rodney’s stuff. His walks don’t come with a league-average rest of the profile. His walks come with a relatively unhittable rest of the profile. More generally, as another point, Rodney is sort of an illustration of the stereotypes of relief pitchers. Rodney is not the stereotypical relief pitcher, exactly, but he captures the volatility. We’ve all seen him, now. Some would say they’ve seen enough of him. We always had some concept of Fernando Rodney, but now that he’s our own, we’re more able to really feel the experience. Not a single one of us trusts Fernando Rodney to throw a strike when he needs to. A lot of Mariners fans already prefer the idea of promoting Danny Farquhar and demoting Rodney to setup, or something lesser. So, consider how Rodney makes you feel. Now consider that, as recently as 2012, Rodney posted the lowest ERA in baseball history. Consider that, as recently as 2012, Rodney posted a top-20 walk rate. Two out of every three pitches were strikes. A few years ago, Rodney was a closer who didn’t even make things interesting. That made him interesting. It has to be one of the miracles of our times. In Rodney’s career, before that, he threw 62% strikes, with 12% walks. In Rodney’s career, since that, he’s thrown 62% strikes, with 13% walks. There’s just a one-year anomaly, and it’s not even like it was a Tampa Bay-specific epiphany since the next year, still in Tampa Bay, most of the numbers returned closer to average. For absolutely no reason at all, Fernando Rodney ripped off 75 innings of being consistently amazing. The Mariners have their own other example in Tom Wilhelmsen. Wilhelmsen, like Rodney, throws super hard with a quality second pitch, and Wilhelmsen, like Rodney, didn’t used to be thought of as a strike-thrower. Then, suddenly, the strikes arrived, then, suddenly, the strikes disappeared. Currently they occupy the same bullpen, sometimes slated to pitch back-to-back. A major difference is that, when wild, Rodney still gets his whiffs. So he can still get himself out of trouble. Wilhelmsen’s not getting strikeouts anymore, and that makes him an intriguing unknown. It’s obvious what he can be, because he’s been it. It’s also obvious you can never predict when things might click, if they click ever again. That guy you don’t trust in the Mariners bullpen — just a few years ago, he was virtually perfect. That other guy you don’t trust in the Mariners bullpen — just a few years ago, he was also outstanding. The only sense you can make of it is that things don’t have to make sense when you’re dealing with relievers, that sometimes you just get 50-odd innings a few standard deviations above or below the mean. It’s for that reason teams have been willing to pay a premium for relievers they perceive as reliable, and it’s for that reason teams have regretted a lot of those investments. On average, relievers are as predictable as anyone else. But because of the sample sizes, they scatter all over the place around the mean, and sometimes you end up with Fernando Rodney, and sometimes you end up with Fernando Rodney. I hope you’ve been taking good care of your heart. Shhhh….shhh..it’s almost over now. The Astros and Marlins will be gone for a good long while. They were bullied themselves, you see, and can’t help but continue the cycle of violence, borne from their anger and helplessness. They lash out not because they want to, but because they never learned anything different. Collin McHugh had and 8:5 K:BB ratio in 14 AAA innings coming into last night’s game, FYI. Either the PCL is no joke this year or the M’s…never mind. OK, the M’s have avoided the Astros’ best pitcher to date, Scott Feldman, but today they’ll tangle with the Astros most *talented* hurler, Jarred Cosart. The strong-armed righty came to Houston in the Hunter Pence deal in 2011. He sits in the mid-90s with his fastball, but like Nathan Eovaldi, he’s had some control issues coming through the minors and never quite put up the strikeout numbers you’d imagine for someone with that kind of velocity. What he has shown in the majors thus far is an ability to get plenty of ground balls and avoid really loud contact. His HR/FB was pretty lucky in 2013, and it could certainly regress – but he’s a righty who gets a staggering number of GBs against *left* handed hitters. He’s been better against lefties overall thus far because of it. He’s pitched all of a handful of big league games, so you wouldn’t forecast that to continue, but it’s something to keep an eye on – he had a slightly better MiLB FIP against lefties too, though this was due to a couple of HRs more than sustainable differences in K:BB/batted balls. In fact, he reminds me a lot of James Paxton. Just looking at the vertical movement on their fastballs, you wouldn’t peg it as a grounder-generating machine, but it is. Like Paxton, he backs it up with a big curve ball that *also* gets ground balls. Paxon’s fastball has a bit more arm-side run despite his over-the-top delivery (and may be something that Paxton tweaked a bit during 2013), but Cosart’s more of a classic cutter. Depending on the pitch fx source you use, it may be that the cutter is essentially the ONLY fastball he throws (as Brooks Baseball suggests); others (MLBAM) think he uses it most often, but mixes in quite a few four-seamers as well. Looking at this chart, I don’t see a clear break between FC and FA, so I’d tend to believe the Brooks coding, but it’s not critical for game thread analysis: Cosart throws a lot (or nearly exclusively) 95mph cutters that allow him to get ground balls and frustrate lefties. He’s not close to a finished product; in his last start, he gave up 7 runs on 4 walks and 2 HRs in just one third of an inning. His control/command issues prevent him from taking the next step and becoming an elite starter, but Cosart is talented and has done an admirable job of learning in the big leagues. He was clearly due for some regression coming into 2014, but I’d like to have a guy throwing a 95mph cutter all day on my team. Chris Young starts today. I’d say that things have to get better as he’s pitching in a fly-ball friendly park, but then, so is Marlins Park. I don’t know. Do something interesting, Mariners. I feel like this season has already fallen into familiar patterns – snark about the M’s, add in some Felix-worship, talk about prospects – so what’s one more: the Rainiers are pretty fun to watch, and you should do so if at some point it stops raining. The R’s are crushing the ball despite playing most of their games in damp and chilly Cheney Stadium thus far. After a slow opening series, SS Chris Taylor is leading the charge with a .636 slugging percentage. AAAA vet Cole Gillespie didn’t seem to have a future here, as he’s not on the 40 man, but he’s at .362/.456/.741 so far, and he could get a look if Saunders/Almonte continue to struggle. Given that Nick Franklin’s already up, it looks like they’ll give the erstwhile IF further looks in LF/RF, but he’s slumping like everyone else. Anyway, go see the Rainiers some time if only to remember what it looks like when a team scores lots of runs. With rain in the forecast, the M’s decided to give Hisashi Iwakuma a simulated game in Seattle as opposed to sending him to Cheney Stadium to pitch with Tacoma. Ryan Divish reported that he was throwing 89-90, and stopped at 58 pitches. Shannon Drayer tweeted that he’ll go up to 75 pitches on Sunday, and then perhaps 90 after that. Happy Felix Day – may it end happier than last Felix Day. About a decade ago now, Michael Lewis’ “Moneyball” came out and changed the way many fans looked at the game, and, importantly, got businesses and organizations around the country to think about market inefficiencies and how they balanced things like tradition and organizational memory with data-driven analysis. For a while there, Paul DePodesta, Billy Beane and Lewis were popular on the lecture circuit, talking about opportunities and threats and how corporations like baseball teams or car companies or government departments evaluate claims and make decisions. Whatever you think of the book, whether you think it gave short shrift to Tim Hudson and Miggy Tejada, or whether you thought it was a landmark in the appreciation of and realization of the power of data, it was a pretty big deal. The fact that firms paid to discuss these concepts showed just how transferable certain skills and approaches could be. With the right message, an executive in a ball club could conceivably help an executive in manufacturing or marketing. Admittedly, I’m somewhat biased; I’m sympathetic to the specific message that Beane/DePo like to talk about, but they’re just one example, and I feel like baseball’s richness has interesting concepts hidden within it. This is actually not a complaining-about-the-M’s-FO post, this is about Felix. Look, the whole “use data” thing is really important, and if it bent the curve in industry even slightly towards rationality, cool. But I’ve been just stunned watching Felix this year, and I keep thinking there is an incredible story that Felix himself probably isn’t equipped to tell. The A’s had to contend with competitors with far more resources. Felix has to contend with aging, regression to the mean, and the fact that everyone on every team gets to prepare for *him*. He’s a known entity, and it’s not like he’s become a knuckleballer or shifted to a sidearm delivery. Felix has a target on him every time he pitches, and he’s lost several ticks on his fastball since debuting in 2005. And to this point in 2014, he’s gotten better. Every small sample size caveat applies; we’re still in March. But at least in the early innings, Felix has thrown four games of Pedro-in-2000 ball at his divisional rivals. As you know, many advanced pitching stats like FIP and xFIP have smaller spreads than ERA/RA. That’s because by ignoring aspects of performance that are more influenced by luck – strand rate, BABIP – they tend to pull pitchers back to the middle. Any truly amazing performance, like any completely abysmal one, is a combination of true talent and luck; winning 116 games means you had an amazing team AND you got a bit lucky. So, Felix right now has an xFIP – a measure doubly-insulated against “lucky” stats – is 1.84. To say that that number will rise is trite and missing the point entirely. Of course it will. But a 28 year old Felix, after over 1,800 major league innings, started off this season with the same 92-93 MPH velocity and ripped off 39Ks to 3 walks. By xFIP, he’s been UNlucky. The point is that Felix has adapted and is now lethal to batters, and *I can’t figure out how. * The movement on the pitches is the same, the velocity’s essentially the same. He seems to throw the same number of strikes*. He doesn’t have a new pitch. He’s throwing the same pitches to hitters who’ve seen him dozens and dozens of times – Coco Crisp has faced him 66 times! Howie Kendrick has 73 PAs! – and they’re reacting like they’ve never seen a pitch before, let alone a Felix change-up. How’s this possible? To be fair, it’s not just Felix. Clayton Kershaw debuted as a young fireballer with an unreal curveball and command issues, and over time turned himself into clearly, unquestionably the best hurler in the NL. He did it despite losing some velocity and despite throwing his curveball far less (sound familiar?). Command is a crucial part of the equation to be sure, but so is limiting contact. Do they make trade-offs consciously? Do coaching staffs help them plan their attack, and do they tailor it to specific line-ups? Or do they get to a point where they stop thinking about the other team entirely? If so, what do they think about instead? There are cliches to fill the space here, like take it one pitch at a time, or trust your stuff, or focus on the gameplan, but to be pithy about it, that won’t sell on the lecture circuit. What IS Felix’s gameplan? The fact that his change-up and sinker are now 2 MPH apart in velo and with similar arm-side run…that runs counter to decades of accumulated pitching wisdom. It’s also clearly “the gameplan.” Does Felix think about this? Does he sequence them differently now than he did three years ago when the velo gap was nearly as small? Does he target different parts of the zone? Felix is extraordinary and Felix is way more extraordinary than we thought. This weekend for reasons I can’t even remember, I was reading about the evolutionary dance between rough-skinned newts and garter snakes, two animals that are pretty common around here. The newt secretes a very, very powerful toxin (TTX, the same stuff in blowfish livers that scare sushi-lovers off of fugu) from its skin. Garter snakes developed a way to process that poison that allows them to eat slow, docile newts (you don’t have to run fast from predators when you are literally built of tetradotoxin). Many newt populations have responded by growing ever more toxic. The snake apparently required fewer genetic steps to develop immunity (since the process only happens in its stomach, as opposed to its skin), and so has pulled ahead even in areas in which the newts are many times more toxic than poison dart frogs. I keep thinking of that story when I look over Felix’s early 2014 stats – all of the work hitters can do to make themselves more toxic. Stacking line-ups with lefties, or watching tons of video. The A’s add a bunch of fly-ball hitters who hit *better* than average against sinker-baller/ground ball pitchers. But the snake makes a tweak and swallows the newt, and slithers off unaffected. Oh, uh, Dallas Keuchel is a ground-balling lefty who is nothing like Felix at all. Fastball/slider/change-to-righties. * Here BIS and pitch fx differ. To pitch fx, Felix has thrown FEWER pitches inside the zone, and gotten batters to chase many more of them. To BIS, he’s thrown MORE pitches in the zone. This is essentially the opposite of the discrepancy with Paxton, where BIS thought he had an extremely low zone%, but got swings anyway, while pitch fx saw him as pounding the zone while hitters were powerless to punish him for it. Early in the season, these discrepancies are larger and perhaps more numerous; it’ll be interesting to see if they converge over time. On the afternoon of April 15, the Mariners were 7-5, having the day before beaten the Rangers by six runs. Out of the gate, Dustin Ackley was hitting well at the bottom of the order. Lloyd McClendon spoke to the media. On the afternoon of April 21, the Mariners are 7-11, having over the weekend been swept by the Marlins. Brad Miller hasn’t found his stride at the plate. Lloyd McClendon drafted a lineup. Is there even a criticism here? I don’t think there’s a criticism here. You could say, okay, maybe Lloyd McClendon is a flip-flopper, but another way of describing a flip-flopper is saying the person has an open mind and is willing to change. McClendon liked the original setup. If he didn’t, it wouldn’t have been the original setup. But now he’s responding to something — maybe it’s just early success and struggles, or maybe there’s more to it, I don’t know. Clearly, McClendon doesn’t think Ackley will be overwhelmed batting higher, and maybe the sense is that Miller has been pressing in front of the lineup core. If you even want to call it a lineup core, but that’s a different story. The surface point here is that it took Lloyd McClendon one six-game losing streak to change his mind about something he suggested could last all year. The broader point, as Matthew has written about before, is that while managers talk to the media pretty much every day, they’re under no obligation to be entirely truthful, and what a manager says one day might not be what he says the next. They change their minds, because the season’s long and unexpected issues can crop up. McClendon isn’t a liar or a hypocrite or something. He’s a baseball manager who makes decisions, and when managers are asked about their decisions, they explain they were made with conviction, because that’s a part of leading. Leading is making tough choices, and believing in them, and possessing a willingness to do something different if circumstances demand. The Mariners were probably due for a lineup switch, so here’s a lineup switch. It will work or it won’t and there will be a lot more different lineups in the next five and a half months. Don’t judge a manager by what he says, and don’t freak out if he seems to verbalize too much of a commitment. Judge a manager by what he does, and understand that they know what’s going on. They want to win even more badly than you do, and they’re constantly conceiving of all possible combinations. There were reasons McClendon said he wanted to keep Ackley low. There are reasons now he’s willing to move Ackley up. We don’t even know for sure whether this is better — it could be that Ackley isn’t ready to hit second, that he could really benefit from more time at the bottom like McClendon preferred. But let’s just take this as a sign of open-mindedness. Don’t judge someone as being closed-minded until you have sufficient evidence. It’s easy to say something’s going to last a while before a while happens. The circumstances of a baseball team change literally every single day, and no manager can know what things are going to look like a few days down the road. A manager can only make the best decision he can make at the time, and then, we’ll see. We’ll all see.